Tobias Werron’s writing in “Why do we Believe in Competition?” is a broad survey of the ideas and theories surrounding the concept of competition and how it evolved into the form we take-it-for-granted as today. He continually whittles the definition down by leading us through history and ideas until he approaches a nuanced definition that he believes we should use to inform future research and understandings of the topic and its place in society. The form he chooses for the article is very structured. It’s as if he’s building the concept of competition from scratch, step by step from base to modern complex social phenomenon. His purpose is to show his audience what we may not know about the inner workings of competition. For example, relating to a course on infant psychology I’m currently taking, knowing the psychological development of infants helps us to understand adults and human nature generally. Knowing the process of development helps us to understand, diagnose, and mitigate problems that may arise. When we put Werron’s article beside previous readings i.e. Bateson and Hutcheon, it is clear that the former is a research article with more of a field overview tone to it, and the latter two are more normative, opinion based commentaries on the state of competition and how it is failing us in various ways. Werron refrains from taking sides, pointing out various pros competition based economy was built on. He also highlights cons that skeptics and theorists became aware of after a period of ‘competitive free market’ idealization and, subsequently, its leakage into previous non-competitive social systems. An interesting link between Hutcheon and Werron is their contrasting views on competition in the University. Hutcheon’s article is mostly concerned with the sort of competitive discourse that is burgeoning in academia. She urges us to re-conceptualize competition in a way that is more constructive i.e. both/and rather than either/or. Werron explains that competition works more positively in some fields like science and art (i.e. academia), as an engine for innovation and creativity, but more negatively in other fields where it creates an isomorphic economic and social landscape where competitors become the same for safety and stability because of the unknowability of the consumer and their interests and desires. Salim Salimoff pointed out that recently he has been adopting an approach to life where he avoids looking for binary solutions to problems. I think that Werron is adopting this approach as well in his article. He doesn’t want to contribute a one sided approach, he wants a non-binary explanation that will lead to a more nuanced understanding and therefore, a more accurate diagnosis and treatment. Werron’s definition for competition ends up somewhere along the lines of ‘the struggle between two (or more) parties for the favour of a third party (an audience)’. I found the connection somewhat jarring between the three dimensions of communication mentioned in the class slides, and the three examples of symbolic capital that competitors compete for in their audiences. The former is made up of relevance (to an audience), Credibility, and Attention. The latter is made up of attention, legitimacy, and prestige. Credibility can be mapped on to legitimacy. Attention (obviously) lines up with attention. Prestige can take on the form of attention and credibility combined because humans tend to pay more attention and give more credibility to prestige even if it isn’t quite rational to do so. Finally, relevance to an audience is essential for both communication, and winning over that audience to, say, sell them a good. Selling ideas and selling goods require someone to listen, be convinced, and buy it based on the belief that it is worthy and credible. Communication is not free from the social realm of competition. 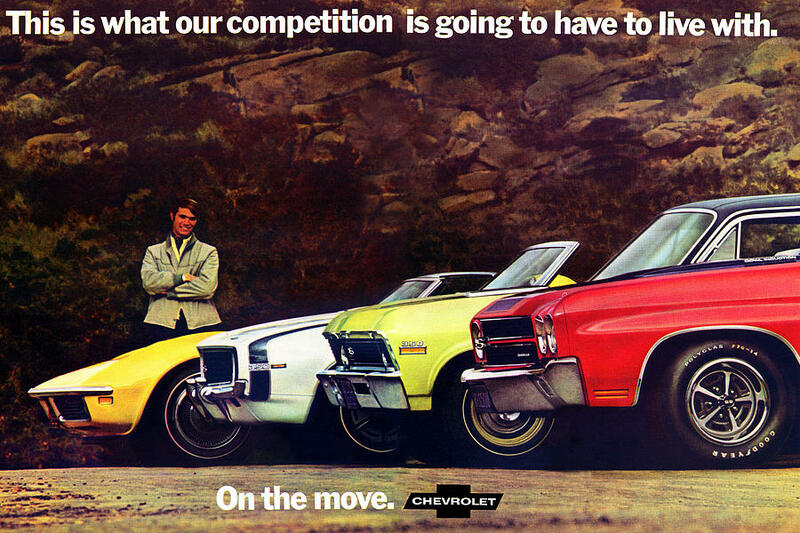 1970 Chevrolet Lineup – This Is What Our Competition Is Going To Have To Live With. is a piece of digital artwork by Digital Repro Depot which was uploaded on October 16th, 2012: https://fineartamerica.com/featured/1970-chevrolet-lineup-this-is-what-our-competition-is-going-to-have-to-live-with-digital-repro-depot.html. Sorry for the late comment, but I really liked the connection you made between the dimensions of communication and the symbolic capital that competitors compete for! I hadn’t thought about how they aligned so clearly before you pointed it out. At first thought I hadn’t really considered communication to be an obvious form of competition, but after thinking about the intricacies of influencing others to consider an idea to be relevant, credible, and worthy of attention, I can see how this ties back to the symbolic capital that plays a role in competitive behaviour. While this revealed competitive nature of communication is especially relevant in an academic setting, I think it is also often relevant in our daily communication with peers, friends and family. Although it may not be to the same extent as in an academic or professional setting, people still often have to consider the relevance and credibility of what they are saying, as well as whether or not what they are communicating holds the attention of the person they are communicating with (especially in the modern technology-driven world). Building on your final statement that “communication is not free from the social realm of competition,” I think it is possible to extend this claim to include personal instances of communication. I’m curious as to whether you would agree or disagree? Do you think the example of our daily personal communication stretches the idea of competition within communication too far? Thanks again for your great post! Hey! Thanks for the reply, glad I returned to check. I was pretty interested in the connection too, It just sort of popped out at me and has been percolating ever since. I agree with you, I don’t think it’s a stretch at all. Information exchange at the more casual social levels still requires relevance, attention, and credibility. Maybe it’s a little easier to gain this symbolic capital because your friends will usually find you credible based on knowing and trusting you (even if this isn’t the most rational thing, for instance, I may take a false fact more readily from a friend), attention is easier to attain because they’re interested in what you have to say, and you know whats going to be relevant to them. This doesn’t mean you can slack off in these domains. From a more psychological point of view, we’re vying to show off our prestige. We are essentially selling our image to an audience and we need to clearly communicate to the relevant audience, seem credible, and have their attention to gain friends and fulfill our social needs. Social relations are all about communication of your image as a worthy friend, and then further a communication of your needs. We are competing for the respect and alliance of others. You can only have so many close relationships (Dunbar estimates that number at around 150 based on our brain size compared to the social group sizes of other species in relation to their brain sizes). So, there is a scarce resource there and losing out is detrimental to one’s psychological and physical survival. It’s important to be the right kind of person to make friends and you have to show that through communication. You’re right to bring up the fact that we are living in a technological age, we seem to be living in something like an attention economy where corporations are competing for our attention where they literally turn symbolic capital into economic capital. With social media we are competing for attention, credibility, and relevance to our audience to boost our self-esteem (this is probably our instinct to make friends and be sociable being taken advantage of and turned into a neurotic unfulfillable addiction). We want to feel like we are part of a social group and respected. Evolutionarily we only had to deal with small tribes of people; We our not evolved for our current environment. Hey, thank you for such a thoughtful response! You have an interesting perspective on this topic and I’m glad I got to hear it. The point that you made about corporations turning symbolic capital into economic capital is really interesting to me, and it’s something I want to do more research on. I might veer a little off topic here, but I’m studying political science and what you said about living in an attention economy reminded me of what we talked about in a public policy class that I’m taking. We were discussing social media’s impact on the broader media system and the idea of a “new attention economy” was brought up, and how social media is somewhat “hacking” our attention. According to this research, this idea is especially true for teens, (https://www.statista.com/chart/15720/frequency-of-teenagers-social-media-use/) but I would include young people in general in the discussion as well. It’s interesting to me to see how competition plays a role in so many parts of my life when I hadn’t noticed it before, like when I’m talking to my sister but I’m simultaneously competing for her attention with Instagram. I would definitely agree that in a way our basic human desires to have connections/make friends are being taken advantage of. I can also see how constantly competing for relevance, credibility and the attention of masses of people on social media is a very modern phenomenon that can potentially lead to negative emotional and psychological effects (as a result of our being inadequately evolved for the current environment as you put so eloquently).